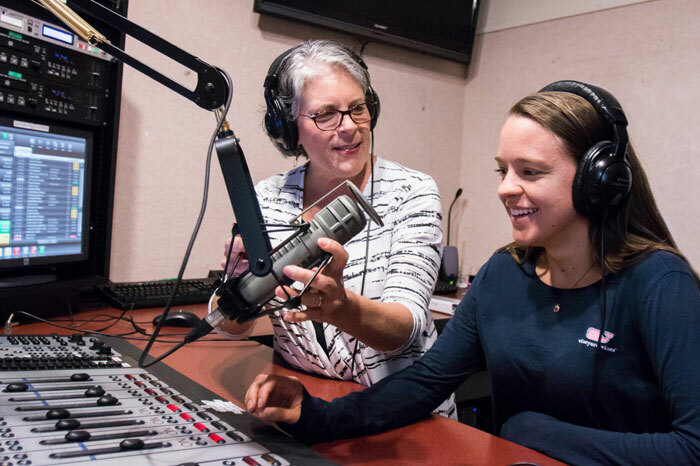 Joan Toohey Wesman brings 25 years of radio experience to the classroom. Prior to teaching at Principia, she worked as a producer for Fresh Air, hosted by Terry Gross on National Public Radio, and for the World Service radio program of The Christian Science Monitor. In addition to teaching in the Mass Communication Department, she advises the Radio Club and TV Production Club, which provide students valuable, hands-on broadcasting experience. What do you love about teaching at Principia? Our small class size enables close relationships with students that go beyond the classroom. I love having the opportunity to advise students about college and long-term career plans, and these sessions often turn into wide-ranging discussions about motives, goals, and life choices. Also, being able, when it’s appropriate, to share insights and ideas based on the teachings of Christian Science is a unique opportunity. In addition, I really enjoy advising the radio and TV clubs, where students produce their own live radio shows or help produce PCTV, the College’s television news show. What research/special projects are you working on right now? Last summer, I took an audio documentary course at Duke University's Center for Documentary Studies and am excited to help students understand and get involved with the new, hot medium of podcasting. Audio podcasts are a creative and powerful medium for storytelling, and they’re being used to share everything from company stories in the PR world to more journalistic stories in the world of news and features. If you could give students only one piece of advice, what would it be? This is a time to push yourself outside of your comfort zone, to explore avenues of knowledge and experience you haven’t encountered before. There is an amazing amount of diversity on our campus—don’t miss the opportunity to expand your view of the world by getting to know students from backgrounds and locations different from your own. Also, don’t miss hearing the world-class achievers and thinkers who speak on campus. I'm amazed at the number of truly inspiring speakers who come to campus each semester—speakers you would pay a lot of money to hear in large cities. I started my career as a high school English teacher, and I was drawn to teaching throughout my radio career producing Fresh Air. I trained new hires for the show and was sent on a U.S. State Department program to train print journalists in South Africa to use radio in covering the first democratic elections. After more than 20 years producing Fresh Air, I felt a strong desire to give back, so combining my love of radio and my love of teaching made a lot of sense. If you had a day off and weren’t allowed to use it to catch up on work, what would you do? My fantasy day would be to sit on a beach in Maine, smell the salt air, listen to the sound of the waves and the gulls, and read a good novel. What work would you pursue if you weren’t a professor? I would explore working for an organization that supports and trains young journalists working in countries that don’t have the same freedom of the press that we have in the U.S.